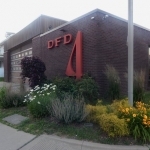 Plans for the closing of Danville’s Number 4 Fire Station remain on schedule. Public Safety Director Larry Thomason says the station on East Main Street will officially close Saturday morning, July 1st. He says the equipment and manpower from Station 4 will move to Station 3 on North Griffin Street just prior to 8:00 a.m. Saturday. The Danville City Council voted on June 6th to close the East Main Street station in a cost-cutting move. Director Thomason says even with the closing of the station, he thinks the consolidation will still allow the city to provide the services necessary within standards firefighters try to meet. The move means there will be more manpower at Station 3. ‘’We will have two full crews working from that station,’’ says Thomason. He adds the additional manpower will allow the city to respond immediately with the aerial or ladder truck in the event of a structure fire. Part of the cost savings to the city includes the fact that an earlier planned access road from Winter Avenue to the Holiday Hills area will not be built.